Please Note: This kit does NOT include installation instructions. Certified Audi VW Technicians installing this kit will need to refer to their factory service manuals for proper installation. The highest quality Volkswagen Golf 5-speed automatic transmission service kit on the market! OEM German parts and German RAVENOL transmission fluid. 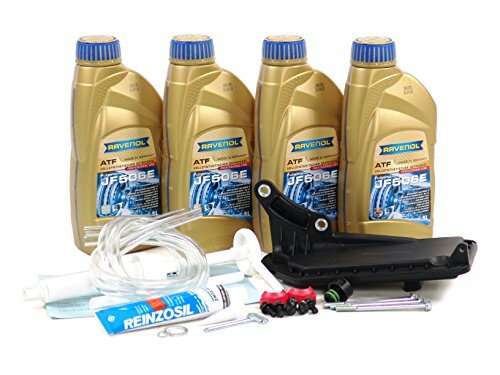 RAVENOL JF506E fluid meets the factory recommended ATF specification VW G 052 990 A2 and is specifically designed for the VW style 5-speed transmissions. The fluid hand pump is a cost-effective equivalent to the factory VAG 1924 tool and helps fill fluid into the transmission for a substantial cost savings over other expensive fluid transfer tools. BLAU® VW transmission fluid filter service kits include everything to perform the highest quality transmission fluid and filter change!